Saturday, February 25: It was cold this morning when S-3 went down to milk, and others dug the ashes out of the furnace, lit the fire, and skimmed yesterday’s milk; but by three o’clock, when we were filling the wood rack in the basement, it was so warm we didn’t want coats. The male two-thirds of the family cut trees on the south hill and bucked them down to the dry pond above the barn. Only two trees — tulip — but they think they will get all the two-by-eights they need for the barn rafters out of just those two. They also brought an oak, split, off the west hill, to cut for four-by-twelve floor beams. There was some brush-burning and clearing going on, too. Up at the house, S-5 was cooking down thirty gallons of sap, and making almost three gallons of ice cream — chocolate and coffee. S-6, the baby, has a temperature, and put a severe crimp in home progress. The mild weather went far to raise late-February spirits around here, and they need raising. The snow is lying in rotten furrows all around the house, the top layer of dirt has thawed, and now everyone who comes in brings mud in with him. We have many projects in projection, you might say, but can’t get too forward on most of them. We are grateful for the sap season, and the repair of the sickle bar mower, to keep us busy on the days we can’t get out. February 19: The temperature is dropping again, but the sun shone on Saturday, and the guys brought logs out of the bee yard and milled six sections -about three tree trunks — into twenty-nine two-by-sixes and some miscellaneous slab lumber. That is more than enough for framing the walls of the barn addition. We could hear the yells as they rolled some eighteen- to twenty-four-inch diameter logs onto the road; it was mere enthusiasm, but sounded more like impending disaster. At the house there was pruning going on, and our hands are bloody today as evidence. Now the apple and cherry trees at the house are done, but there are still the ones in the south pasture, and at the Sisters’, to do — we hope for a sunny, cold day next week. The hams and bacon from the pigs butchered in January are finally thawed enough for smoking; if the weather doesn’t get too cold this week, we’ll put them in the smoke house next weekend. That means we have to go get sawdust from our friendly neighborhood sawmill. We might use the cherry sawdust the boys milled Saturday, but it’s too fine to burn well. It hasn’t been cold enough the last few nights to bring the sap down the maple trees, so we’ve only boiled down about a gallon of syrup. The February warm up is usually like that. When spring really comes, there will be another run of sap, but we may have to ream out our tap holes to get a good flow. Maple syrup on Sunday pancakes only masquerades as real food; really, it’s dessert for breakfast. The thaw also means shifting Isabel and the steers off the south pasture before they pug it up. The area around the chicken house is, as anyone who keeps chickens will know without being told, already a blasted wasteland, so we put Isabel over on that side of Jeddo’s Run, and the steers in the little west pasture. Shawn spread a couple of bales for them, and now that slope will get some mulch and manure, like the header picture for this journal shows on the south pasture. We can keep the steer on the west hill because it doesn’t run with water the way the south pasture does in a thaw, partly because the west hill doesn’t hold snow and ice like a north-facing slope will do. Did we mention that the Sow’s Ear is established on twenty-seven of the most worthless acres in eastern Ohio? The south pasture, despite an average gradient of about one in four, is a boggy mire when spring comes, and even in a drought like last year’s, there are one or two squishy places. So much greater the triumph when we make it work as pasture. If we can do it here, what will others be able to do on reasonably arable land? what do you do with all that milk? This entry is not exhastive; we sometimes forget to enter things. Whey and buttermilk go a long way toward feeding the pigs, chickens, and cats. We drink about 1 1/2 – 2 gallons of milk a day, and, yes, we do eat all that butter and cheese. Any milk we can’t use — say, in spring and summer, when we are getting about eight gallons a day — we start steers on, and either eat the steers ourselves, or sell them to our grass-fed beef customers. Our regular February thaw is here and we have taps in about fifteen trees. Yesterday’s harvest is only seventeen gallons of sap; this only cooks down to about five cups of syrup, but don’t they look good? “Liquid gold”, too, as each pint represents a good deal of work; the boys, however, consider anything outdoors an improvement on doing schoolwork if the temperature rises above freezing (and even when it doesn’t). Saturday Shawn and the boys got a day in the woods. Lumber for the new addition to the barn will come off the south and west hills; right now they are cutting in the clearing, letting sun in on what, hopefully, will be several days’ of rotational grazing when the grass is better established. They took out an oak over two feet thick, which should mill out to some sturdy beams for the hayloft. These are skidded off the hill by manpower alone, and stockpiled in the beeyard until we are ready to mill. Meanwhile, S3 is drawing up plans for the framework, while S4 drafts the floorplan, making sure his pigs get pride of place. Monday brought a good thaw. We usually see one in February, and use it as an opportunity to get taps in our biggest maple trees. 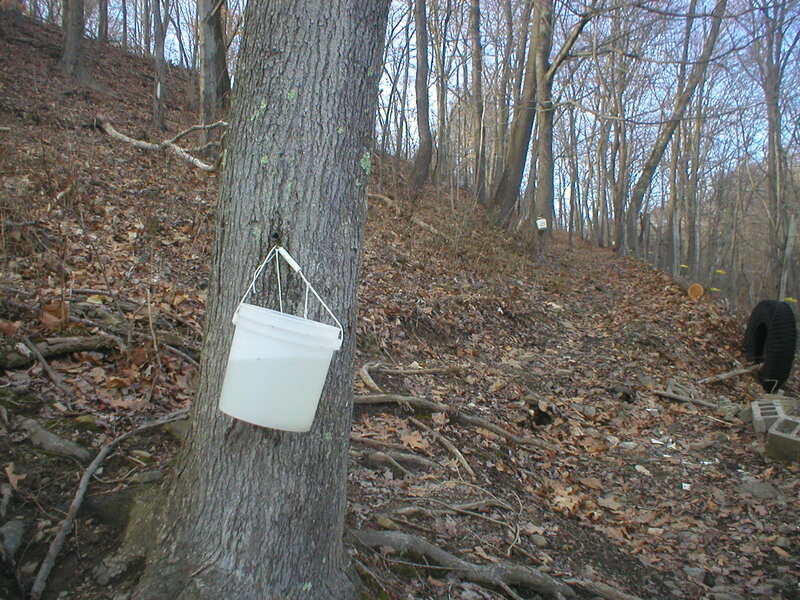 The boys hung about fifteen buckets, and may put out more when the sap really gets flowing. In past years we have gotten as many as five gallons of maple syrup, which is adequate, but not ample, for a family of ten (nine at home now that S1 is farming his own acres in MN). We sold the largest of the short yearlings last week. After last summer’s drought, we needed to get some animals off the hay, and off the green-up when it comes. We had buyers for them, so we could get them custom-butched and make a little profit. That money is the boys’, who won’t spend it as fast as Mom and Dad would. They hung in about 150 pounds each, which was about what we’d guessed, and the customers seem very satisfied. Bought thirty bales today to help get us through the winter — there would have been plenty of hay for all the animals this winter if we hadn’t had to start haying them in the late summer. After July the rain just gave up, and the fields had no more forage than the barn roof. We are still trying to learn this format. The boys were skidding logs off the west hill this morning, trying to take advantage of the snow still on the ground to keep the lumber logs clean — nothing like dirt to dull a saw blade. The thaw is getting ahead of them — I can see the track of the logs d0wn the steep side of the hill, and it cuts right through the snow to brown earth and leaves. That’s life. We want to encounter spring with plenty of lumber logs down by the barn site, so we can begin building whenever the ground thaws. Something has had a bad effect on the wildlife population in our corner of Ohio. Deer season was almost a bust — with two hunters out morning and evening all week, we only bagged one. This in an area where the deer are usually a road menace. A ten-mile stretch of road would normally sport somewhere between two and five dead deer; this winter the average seems to be closer to one deer per twenty to thirty miles. The song birds, too, of which we usually have a congregation at every feeder, are in much reduced numbers this winter. Previously, we have had to fill the kitchen window feeder and the porch feeder at least once a day in snowy weather, to meet the needs of our over-wintering cardinals, chickadees, titmice, juncos, and pine siskins — the cardinals alone often numbering as many as seven to ten pairs around the kitchen window. This year I have counted two pairs — well, actually they may be all males, the dull ones being juveniles rather than females, I suppose, since they might not be in mating pairs this time of year, but anyway, about four cardinals total, a handful of chickadees and titmice, and the stray sparrow or wren seem to be all we have in the area this winter. What is the cause of this decrease? We had a bad drought last summer, which may have had an effect on overall numbers, or perhaps the late hard freeze of last winter was more significant. With the birds, it’s possible they simply went further south, or stayed further north, this winter, gifted with an instinctive knowledge of what the winter would bring in the way of weather. It is interesting to catalogue the details of weather and wildlife; maybe in about a hundred years we’ll even be able to trace a pattern.